My mother. She was a stay at home mom but was always working on commissioned projects. I remember she would spend hours sewing everything from clothes to curtains, baking and decorating cakes and making handmade party favors; people would hire her for all kinds of creative projects. It was from her that I learned I could turn my creativity into a career. I am a tattooer specializing in black and grey work. Most of my designs are either floral or inspired by classic American tattoo flash. I also sell my designs on various types of merchandise and as art prints. Over the years I have participated in tattoo conventions, pop-up shops, and worked as a guest artist at a few different studios around the world. 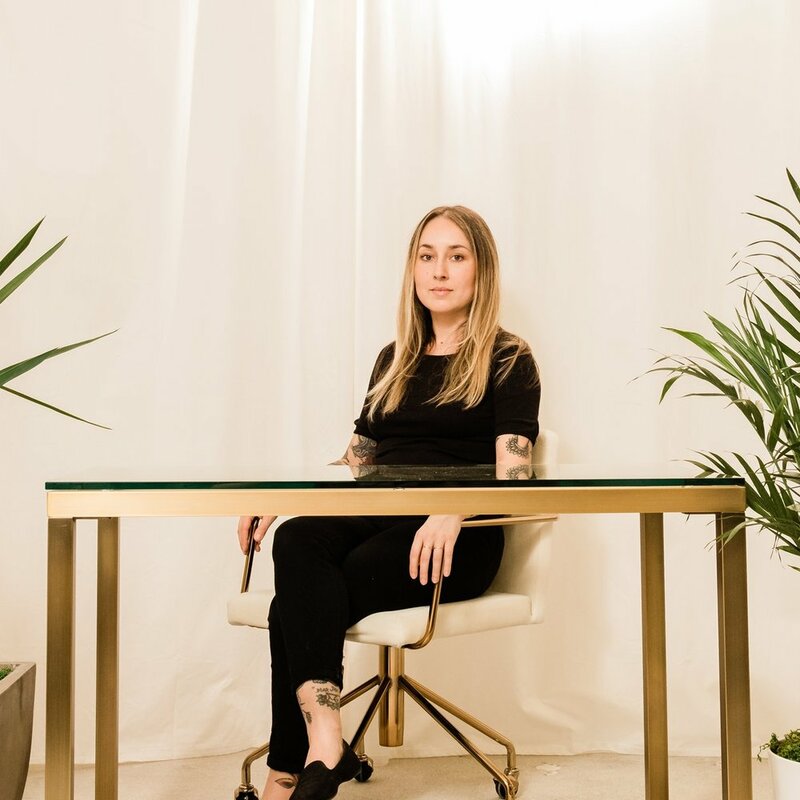 This year I opened my first business: Swan, a private tattoo studio in Jacksonville, FL, so I am now also learning what being a small business owner entails. What does your typical workday look like? What various ‘hats’ do you wear throughout the day? A typical workday here in Jacksonville starts around 8am when I wake up. After getting ready and having breakfast, I head to the studio around 11am. I always clean up the studio in the morning, making sure things are in order and supplies are fully stocked. My first client will arrive around noon, we do a quick consultation, then I draw their design and do the tattoo. My second client will arrive around 2:30pm and we do the same, and the last one around 5:30pm. I usually get home at 9pm and catch up on emails, pack merchandise orders, and work on design ideas or art projects until around 1am. When did you first become inspired by tattoos/tattoo art? Where do you think that passion stems from? When I was about 8 years old, I saw an elderly woman in a small town in Mexico with a Guadalupe tattoo on her forearm, and I remember thinking she looked so cool. From then on, my interest in tattooing grew, from drawing tattoos with Sharpie on boys in school, to later drawing designs for my friends (which were then actually tattooed on them.) When I turned 18 I started getting tattooed as well. Have you always had an artistic spirit and upbringing? What about an entrepreneurial one? My parents were very creative and “do it yourself” kind of people. Watching them take on various projects around the house and come up with alternative solutions to problems before the era of the internet, and seeing how self-sufficient they were taught me independence and imagination. When I was about 5-6 years old I would tear out colored pages from my coloring books and sell them to pedestrians in my neighborhood for 5 cents. In middle school I would draw on mailing labels and sell them to classmates for 25 cents. Kids would decorate their binders with my labels and I would use the money to buy veggie burgers in the cafeteria during lunch. When did you know you wanted to pursue a career as a tattoo artist? What inspired that for you, and what has your journey in the field been like since? I knew around the age of 16. I had older friends with tattoos and I knew that I wanted to pursue a career in art or drawing. Tattooing looked like fun, and the fact that my parents hated them made it even more appealing to me. From then on I was on a mission to figure out how to become a tattooer. How do you stay organized and split your time between all of the demands of your job? Do you have any organizational tools or tips for success? Honestly, it’s mainly mental notes and multitasking. I still use a paper appointment book and wall calendar and write lots of reminders on them. Occasionally I’ll have an assistant help with my online store and at tattoo conventions, but 90% of the time I’m a one-woman business. I’m always working. Whether I’m home or traveling, I find a way to do something productive related to my business. I love being an artist and tattooer so I’m happy when my life is consumed by my career. How many tattoos, on average, do you give each week? Month? Year? In an average week here in Jacksonville I'll do about 3-4 custom designed tattoos per day. I try to schedule between 65-80 clients a month, depending on the sizes of the designs. During tattoo conventions or when I work as a guest artist out of state, I do only pre-drawn flash designs, so I am able to do 6-8 tattoos in a 10 hour day. What keeps you anchored to Jacksonville? What is your relationship to the community here? When I moved here 11 years ago, I had never heard of Jacksonville. I didn’t know anyone here, and I had never even been to the East Coast. I met so many welcoming and generous people here that it quickly felt like home. I love that it has a small town — everyone knows each other — kind of atmosphere, and I have always felt so appreciated and supported by the community. I’ve watched the city blossom over the last decade and I’m excited to see how it will continue to grow in the future. What kind of relationships/dynamics do you form (or not form!) with your clients? Do any clients or client-related stories come to mind for you? People who started as my clients have become some of my best friends. During my first year of tattooing, Tasha Brooks started coming in every two weeks to get work done by me. We instantly bonded and after spending hours together over a period of many months, we became the best of friends — she has the first full arm sleeve I ever did. 10 years later we are still best friends; we’ve traveled together, lived together, laughed and partied together, and been there for each other as we make our way into the business world — me with Swan, and her with owning Yoga Den Avondale. As a teen I attended art classes for high school students at the Academy of Art in San Francisco and I also completed the semester program at the Oxbow School in Napa. Those experiences helped me develop my skills in drawing and painting that were very helpful when I started my tattoo apprenticeship. My experience working in retail and service industry jobs taught me the importance of customer service and building good relationships with clients. Opening my own business, Swan, has been my biggest milestone. It has been the most challenging, stressful, rewarding, learning experience I’ve ever been through. It really reaffirmed my love for tattooing, if I didn’t love it, I couldn’t have endured this journey. How would you say being a woman has affected your professional experience? Do you feel respected and taken seriously in your craft? My gender is not something I take into consideration when I am working towards a goal, so I’m not really aware of how, or if, it has affected my professional experience. I knew from a young age that this was something I wanted to do, and it didn’t even cross my mind that I would be entering a male-dominated industry. I wanted to learn to tattoo, so I did, and over the years I've worked hard to earn the respect of my peers. Angelique Houtkamp of Salon Serpent in Amsterdam has been a role model of mine from the very beginning. I came across one of her books when I was an apprentice and was inspired by her style and independence. As a strong, talented, businesswoman, I had instant admiration and respect for her. Years later, she invited me to be a guest artist at her studio. I was so flattered, nervous and excited; it was such an honor to work alongside her, even if it was only for a few days. Be prepared to give it 100%. To be successful in this industry you have to really give it your all and make it your life’s purpose. Respect the craft and the history, and look for an apprenticeship with someone who is in it for the right reasons. Do what makes you happy, regardless of what it pays. Editor's note: Myra's tattoo shop — Swan — opens its doors to the public THIS SUNDAY, July 22nd. For those of you itching for another (or first) tattoo, she’s doing one week of flash design walk-ins from July 22-29 in celebration of the new digs. Get there ASAP and expect to wait in line. All photos by Eric McClure. This is an affiliate partnership. That means when you shop using our links/codes, a portion of your purchase goes right back to us, so we can roll out awesome new things for you. Of course, we only promote hand-selected brands and products that we stand behind.